Juzenritsu-in Temple (十禅律院) is a temple with Samurai Style House and beautiful garden located in Kinokawa, Wakayama Prefecture. It was established in 990. 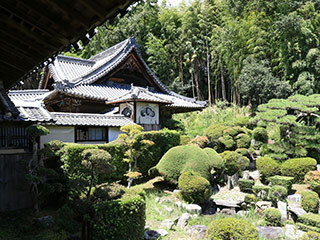 It has a beautiful dry rock style garden and samurai style room which are very unique to the temple. Juzenritsu-in is Tendai Buddhism Temple located in Kinokawa, Wakayama Prefecture. It was established in 990. The living building of this temple was built by the 8th and 10th lord of Kisyu Tokugawa clan. Therefore it has a feature of Samurai style room. Means cleansing mind. It is a dry rock style Japanese garden with background scenery as a part of the garden.